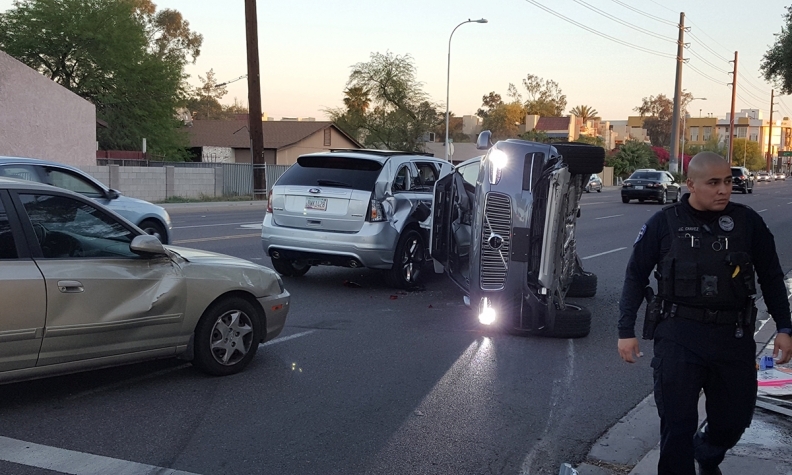 An image from a video distributed by Fresco News shows a self-driving Volvo undergoing testing flipped on its side after an apparent collision involving two other vehicles in Tempe, Ariz., in March. As auto accidents go, it wasn't much: Twelve minutes before noon on a cool June day, a Chevrolet Bolt was rear ended as it crawled from a stop light in downtown San Francisco. What made this fender bender noteworthy was the Bolt's driver: a computer. In California, where companies such as Cruise Automation and Waymo are ramping up testing of self-driving cars, human drivers keep running into them in low-speed fender benders. The run-ins highlight an emerging culture clash between humans who often treat traffic laws as guidelines and autonomous cars that refuse to roll through a stop sign or exceed the speed limit. "They don't drive like people. They drive like robots," said Mike Ramsey, an analyst at Gartner who specializes in advanced automotive technologies. "They're odd and that's why they get hit." What they've found is that while the public may most fear a marauding vehicle without a driver behind the wheel, the reality is that the vehicles are overly cautious. They creep out from stop signs after coming to a complete stop and mostly obey the letter of the law -- unlike humans. Smoothing out that interaction is one of the most important tasks ahead for developers of the technology, says Karl Iagnemma, CEO of self-driving software developer NuTonomy. "If the cars drive in a way that's really distinct from the way that every other motorist on the road is driving, there will be in the worst case accidents and in the best case frustration," he said. "What that's going to lead to is a lower likelihood that the public is going to accept the technology." Sensors embedded in autonomous cars allow them to "see" the world with far more precision than humans, but the cars struggle to translate visual cues on the road into predictions about what might happen next, Iagnemma said. They also struggle to handle new scenarios they haven't encountered before. Waymo's now-retired "Firefly" autonomous vehicle prototypes were rear-ended twice at the same intersection in Mountain View, Calif., in separate instances less than a month apart in 2016. In both cases, the Waymos were preparing to make a right hand turn before they stopped to yield for oncoming traffic and got hit from behind. The state's crash reports don't assign blame and provide only terse summaries of the incidents, but a few themes are common. They're almost always low-speed fender benders with no injuries. The Bolt, for example, was traveling at less than one mile per hour when it was rear-ended. While they represent a minuscule share of crashes in the state, autonomous vehicles are also a very small share of the vehicles on the road. "You put a car on the road which may be driving by the letter of the law, but compared to the surrounding road users, it's acting very conservatively," Iagnemma said. "This can lead to situations where the autonomous car is a bit of a fish out of water." A spokeswoman for Cruise, which was acquired by General Motors last year, said the crash reports speak for themselves. The company's CEO Kyle Vogt said in a September blog post that the company's third-generation autonomous Chevrolet Bolts are "designed to emulate human driving behavior but with the human mistakes omitted." San Francisco's streets are chaotic, but that's helping Cruise program its cars to learn how to react to those challenges, Vogt said in a separate blog post. "People put junk in the street. They park everywhere. People don't obey crosswalks," Vogt wrote. "Our vehicles must be assertive, nimble, and sometimes a bit creative." Waymo, Alphabet Inc.'s self-driving car unit, has tried to refine how its vehicles act so that they are more natural. For example, the developer altered its software dictating how the cars handled turns to be more comfortable for passengers, says Duke University robotics professor Missy Cummings. "They were cutting the corners really close, closer than humans would," she said. "We typically take wider turns." Waymo is also using simulations to try to teach its cars to inch forward at flashing yellow lights. Dmitri Dolgov, Waymo's technology chief, wrote in a December 2016 blog post that the companies were getting better at navigating the nonverbal dance of interacting with others on the road. Ford Motor Co. went so far as to put a vehicle on the road along with a driver masked to resemble the car's seat. The experiment, conducted in cooperation with the Virginia Tech Transportation Institute, was designed to assess how autonomous cars could communicate with other roadway users, using light signals to replace the eye contact and other signals that humans use to navigate city streets. "Humans violate the rules in a safe and principled way, and the reality is that autonomous vehicles in the future may have to do the same thing if they don't want to be the source of bottlenecks," Iagnemma said. Alan Pfohl, a spokesman for the Phoenix Police Department, says the testing is going smoothly thus far. The only crash he's aware of is one last March in which an Uber Technologies Inc. self-driving Volvo crossover was toppled after being hit by another vehicle that failed to yield. No injuries were reported. "Technology can always fail, but so can humans," Pfohl said.